Despite my best intentions to send out personal greetings to friends, I've dilly-dallied and now the holidays are upon us...so pardon the group greetings. I'm at a bit of a loss about all this friend business. When I was a kid I had two or three friends. Sometimes one, and glad to have him. Now I've got my Facebook backing-up with fifty or so friend requests from people I've never really met and then another batch of friend "suggestions". What to do? My son says I should accept as many people as I can to be my friends...and viral marketing experts will agree that I should confirm them, make them fans and I guess ultimately sell them a CD?? First of all most of my friends on Facebook (and MySpace) are musicians who would be more inclined to swap CDs than buy them. I think I'll just end this charade and be friends with anybody who'll have me and send them all my Holiday Blainletter! (now I half expect to get messages back that say "This friend request has expired. You will have to come grovelling back if you still want to be friends"...or something like that. I cast my runes today and the prediction was something like "stand still"...you've planted the seed, wait for the harvest...learn from the obstacles put before you...Nothing very encouraging! And nothing that I haven't seen so many times before in my readings. Well, I'm not going to stand still! I will be moving forward... at my usual pace-slow and steady! Tonight I got another notification and this time it's a website GIVING AWAY my songs! Well, three of them, anyway. They've created a page for me...they found a video of "Blues is Hurting" and a picture of me that I don't think I've ever seen - it's me performing with Brian Kobayama (probably spelled wrong...the guy from Creaking Tree String Quartet) at the Twisted Pines festival two or three years ago. I downloaded one of the free songs and I think the quality is not right but then they had that "Brian Blain player" that played 30 seconds of every song and I thought that was pretty cool. The most interesting thing to see was the section on "Similar Artists": Karen Kay. Corey Harris. Mississippi Mud. Doc Watson. Terry Gibbs, Gary Stewart, Pat Martino, The Bluenotes, Clark Terry, Joe Droukas. Now I'm quite flattered to be grouped with some of these great artists, but I've never heard of half of them ...I even checked out Karen and Joe. Hmmmm. How do they figure out who's similar to who? Is there some kind of algorithm??? Well, as always, I'm grateful that someone cared enough to go to all this trouble. Oh yeah, the website is soundflavor.com Their slogan is "We built a know-it-all record store clerk just for you...Find thousands of free songs based on the music you love" But....eh, WTF? Anyway I took the "high road" and went to Wayne Shorter and I'll never regret it. To see these four master musicians who have been playing together for years just walk onto the stage and start playing whatever came into their heads and take you on a beautiful journey...it was awe inspiring. I went home and did a recording that night - some spontaneous improvised guitar noodling...as close to jazz as I'll ever get. Did a few more Blues in the Schools sessions...this time for the Stellula music project up in the Georgian Bay area, Orillia and Pennetanguishene. Lately it's been older kids and music students. They are a great audience and I'm happy to share some "real world" experiences with these budding musicians. How long have I been playing "Terrace Inn"? I think I wrote it in 01 or 02. Always trying to rock out with that little break in the middle - my "hommage" to Magic Sam - which seemed like a nice obscure reference except since then I've seen many a guitar player doing the Magic Sam "thang" way better than me. I always seem to be playing it with folks who've never heard "Terrace Inn" and who are just trying to follow my "body language". That's one of the things I've got to work on - how to signal the band to stop for my guitar riff. Then getting them to all come back in together! This time I'm sitting in with the Odyssey Blues Band at their Saturday Matinee in St Catharines (running for the last 8 years). This time I really got my signals crossed so they were playing where I wanted them to stop and stopping when I wanted them to jump back in. As always, the audience probably thought it was all part of a worked out arrangement...Ha! Note to Self: Work on cues for Terrace Inn and come in with high energy for the unaccompanied guitar break. "This is one of two recent releases from Canadian based label Northern Blues Music that have focused on Canadian roots and blues artists. The catalogue numbers for Brian Blain's "Overqualified For The Blues" suggest that it has been in the pipeline for a while, and the liner notes confirm this: the first tracks were laid down just before Christmas 2002. Blain is an astute observer of life and this is reflected in his lyrics which are shot through with a wry sense of humour. Few would be able to get away with the opener "Saab Story" which cleverly plays on the Saab/sob pun, but Blain pulls it off with consummate ease. Blain sings and plays guitar throughout, accompanied by a range of familiar names including Michael Jerome Brown, Harry Manx, Paul Reddick, and the rhythm section from Downchild. 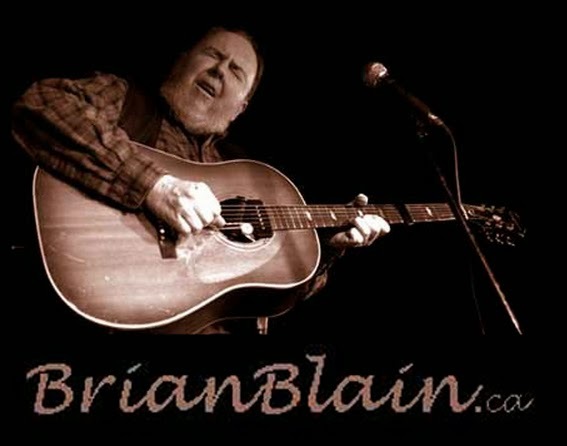 Despite the various line-up changes, the musical quality, remains unfailingly high throughout, as Blain traverses the blues and roots landscape. The album has a light, relaxed feel to it, the main exceptions being the straighter blues tracks, such as the excellent Magic Sam influenced "Terrace Inn" which has more of a rocking groove. Every one of the tracks has a tale behind it, and they are all memorable in their own way. The closing track ("The Big Fire"), in particular, occupies a soft spot in Blain's heart. Every year he enters it into the "Songs From The Heart" contest, although he is still waiting to pick up first prize! "Overqualified for the Blues" is a real grower that amply rewards the listener with repeated plays, and every track has something to recommend it. The standard of musicianship and songwriting throughout is of the highest order. The mixture of Blues and Roots music that makes up "Overqualified For The Blues" is one that is well worth tracking down." Thank you for the kind words, Gordon Baxter! I did my last gig for the year on Saturday and I guess it's fitting that it was the rockingest Ole' Colorblind got all year. I was guesting at the Liquid Lounge blues matinee and the rhythm section was going full tilt and my little Fender Vibrolux was cranked to 9 (and still needed to be mic'd). Last night was the staff party for the jazz festival crew and after some Christmas cheer we made our way to Downtown Jazz's last show of 2008...in a humungus stretched SUV limo. It was quite something to ride in that multi-screen floating bedroom with lights that changed colours but floating is probably not the appropriate adjective because it rode more like a truck. The show was Tuck and Patti, a duo that I remember from the sixties and they still put out that "peace & love" vibe. It did get to me but then I just got all chocked up by a movie about a little girl and her horse...so I'm a sucker for that sort of thing. So without getting too maudlin, my most sincere gratitude to all of you who made it out to a Brian Blain show in 08 and and my hopes that we'll see you again next year in your town (as Morgan Davis used to say)...when we get there. As the year winds down, It's a good time to make ammends. I think I owe my fans an apology - all six of them. Well, maybe there's more than six Brian Blain fans out there but in the space of the last two weeks I've managed to "inconvenience" a good proportion of my cherished supporters. - Very sorry that to the fans who had to write to me to get the start time. Especially sorry that I mistyped my reply and sent them to the club at 6:30 instead of 8:30 (they stayed till the bitter end, mind you). Sorry, sorry, sorry. I will make it up to all of you. In fact I'm planning a "Make-Good" Concert with free admission for all those who may have been inconvenienced when my other life gets in the way of my music. Speaking of my "other life", and while I'm feeling apologetic, I should say sorry to my desktop publishing clients, The Toronto Musicians Association, The Toronto Blues Society and the Toronto Jazz Festival. I will confess right here that there were times when I should have been working on your publication and I just pushed it aside and went to play guitar. In fact, it never fails that I get an idea for a song just when I'm scrambling to meet some deadline. I will end my Blainletter with this little "I.T." tip (for those who hung in and read this rambling rant right until the end): If you're like me, your email inbox is full of messages and you've got all kinds of folders with more correspondence...maybe pictures, other stuff.... Before Jan 1, I'm going to move all the mail in my inbox into a new folder called "inbox 08" and I'm going to move all my other (non-email) files into a folder called "DOCS 08". Likewise with all the pics and client files. Then when I have some time, I will copy those folders onto a CD for back-up. I like having a fresh start at the beginning of the year. May you all have a nice fresh start.